Canadians who want to crowdfund a film, video game or other project can now start building a page on Kickstarter, for public launch as soon as Sept. 9. 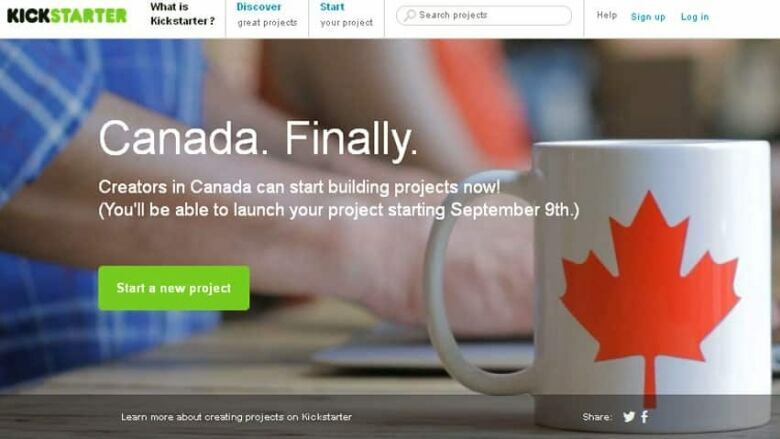 U.S. crowdfunding giant Kickstarter announced on its blog Monday that effective immediately, Canadians were invited to click on the "start your project" button on the company's homepage. Canada has now been added to the U.S. and U.K. in the drop-down menu that pops up. Crowdfunding allows projects ranging from films to unique consumer products to gather small individual amounts of money from a large number of people. Often, funders are promised a "reward" such as a copy of the final product. For example, the Veronica Mars movie collected $5,702,153 from 91,585 "backers," who contributed an average of $62.26 each in exchange for rewards such as a copy of the shooting script or a "Veronica Mars – The Movie" T-shirt. The New York City-based Kickstarter announced in June that it would soon start allowing projects from Canadian creators. As of Tuesday, the company's own statistics say it has helped raise $627 million for 109,294 projects since it launched in 2009, including the high-profile Pebble smartwatch, Ouya gaming console and Veronica Mars movie. Kickstarter takes five per cent of the money raised by projects that meet their fundraising target, while another three per cent plus 20 cents per pledge typically go to the company that processes the payments. Funders do not pay the money they pledged and Kickstarter does not receive any money for projects that don't meet their fundraising goal. In conjunction with its Canadian launch, Kickstarter is hosting a series of meetups and workshops across the country over the next few weeks, which are posted on its Canadian homepage. As of Tuesday afternoon, events in Toronto and Montreal between Aug. 8 and Aug. 13 were sold out. While Canadian projects previously had access to other crowdfunding platforms, such as San Francisco-based Indiegogo and Vancouver-based Fundrazr, Kickstarter is by far the largest and most popular, generating a much larger volume of web traffic, according to the Crowdfunding Press Center blog. Consequently, it potentially provides access to a larger community of funders and therefore more money.